I bought the Built By Wendy Dresses book about a year ago because I loved the Workin' Nine to Five dress. It's the first pattern in the book, so it's easiest and the example in the book was orange, my favorite color, so of course I was smitten with it instantly! Even better, the dress fit when I was finished. 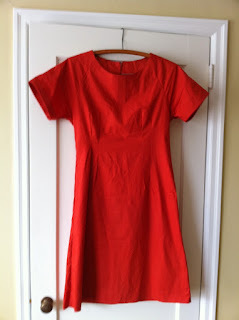 No alterations - a Sarah's Threads first! The mock front placket adds a nice touch to the front of the dress. I didn't add the buttons because, while it was cute in the book, it looked a little too Betty-Homemaker for me. 1. With the mock front placket (above) I sewed the line straight with the help of the adjustable overcast foot on my sewing machine, a fun little technique that I plan to do again soon. 2. The sleeves are great. I've never used a facing on a sleeve, but it ended up resulting in a nice crisp sleeve, which really looks nice. 3. 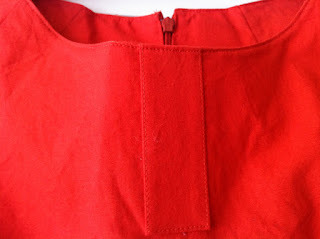 After you have the sleeves attached to the front and back, I'd recommend stay-stitching within the seam allowance to make sure that the neckline doesn't get stretched. I tried a similar dress recently and it "fish mouthed" all over the place. 4. The belt is optional and for this dress I decided to just wear a wide brown leather belt, but done in the same fabric, it could look really nice. 5. I will definitely make this dress again, but I will use different interfacing. The stuff I used was a bit too thick and I'm hoping it will loosen up a bit. There's a "G.I. Jane" version of this dress that has pockets and a drawstring that I think could be really cute. How sweet! Nice topstitching details too!